Shu Kinouchi began dancing at the age of two at Mayumi Kinouchi Ballet Studio under the direction of his mother. At the age of nine, he began participating in ballet competitions in Japan. Kinouchi attended American Ballet Theatre’s Orange County Summer Intensive in 2005 and New York Summer Intensive in 2006 on full scholarship. He has been a National Training Scholar at ABT since 2007. Kinouchi trained on full scholarship at the Hamburg Ballet School in Germany. In September of 2008, he joined the Jacqueline Kennedy Onassis School at ABT. His repertory at ABT includes Swan Lake Act I pas de trois, Flames of Paris pas de deux, and Napoli as well as original choreography by Raymond Lukens, Jessica Lang and Aszure Barton. 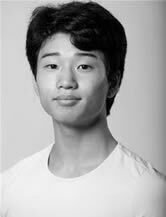 He was a finalist in the 2010 Prix de Lausanne. Kinouchi will join ABT Studio Company in September 2011.